We get it. Cell phone repair can be frustrating. Whatever’s going wrong with your phone, we can get you up and running again. Bring your cell phone by the office, or give us a call, and Nerdy by Design is available to help. Whether your cell phone seems to have stopped working or you dropped and cracked your screen, we can assess the situation and explain all your options in plain language. If you’re having trouble with your WiFi or internet connection, we can assess the problem and provide practical recommendations. While Nerdy by Design is not an Internet Service Provider, we can make sure that your hardware is working properly and help to fix any problems. When you drop off your phone, we make a point of providing exceptional service by optimizing its performance. As a new and growing company, we are dedicated to building our reputation by consistently providing exceptional service. We make a point of exceeding expectations so that you’ll recommend our services to friends in need. Our whole company thrives on creative solutions for technical problems because our company is Nerdy by Design. 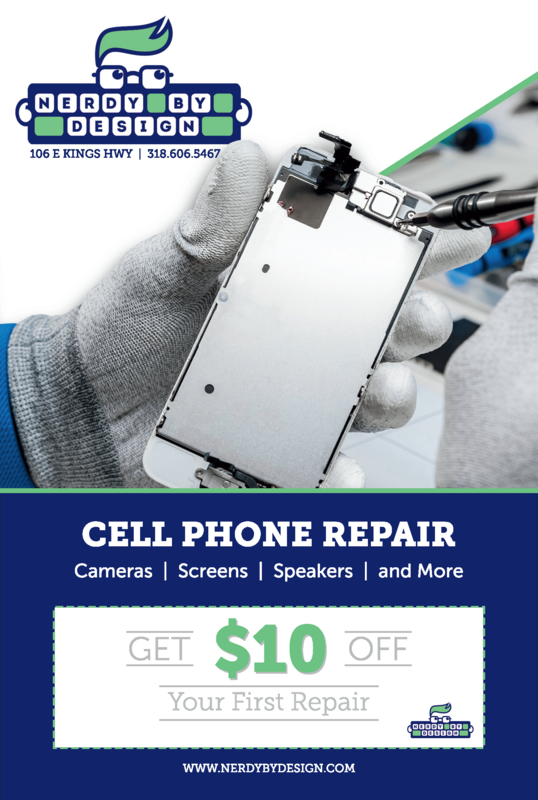 Choose Nerdy By Design for your cell phone repair in Shreveport.